Date written: Chapters 1-8 were written approximately 520-518 B.C. Chapters 9-14 were written around 480 B.C. Setting: The exiles had returned from Babylon to rebuild the Temple, but the work had been thwarted and stalled. Haggai and Zechariah confronted the people with their task and encouraged them to complete it. Special features: This book is the most apocalyptic and messianic of all the minor prophets. Not to be confused with: At least 27 other men of the same name in the Bible, including the son and successor of Jeroboam II (2 Kin. 14:29; 15:8), and the father of John the Baptist (Luke 1:5). Home: Probably born in Babylon; relocated to Jerusalem, possibly in the return of 538 a.d.
Family: Was the grandson of Iddo and the son of Berechiah. Occupation: Probably a Levite (if Neh. 12:16 refers to him), and a prophet in postexilic Jerusalem. Best known today for: His eight prophetic, apocalyptic visions, and his two judgment-salvation oracles, in which he rebuked the people of Jerusalem and exhorted them to complete the rebuilding of the temple. Word in life study Bible . 1997, c1996 (electronic ed.) (Zac 2.4). Nashville: Thomas Nelson. Word in life study Bible . 1997, c1996 (electronic ed.) (Zac 11.16). Nashville: Thomas Nelson. Richards, L., & Richards, L. O. (1987). The teacher's commentary. Includes index. (502). Wheaton, Ill.: Victor Books. Man and horses among the myrtle trees (1:18) The Lord will again be merciful to Jerusalem (1:14, 16, 17). Four horns, four craftsman (1:18–20) Those who scattered Judah are cast our (1:21). Man with measuring line (2:1) God will be a protective wall of fire around Jerusalem (2:3–5). Cleansing of Joshua (3:4) The Servant, the Branch, comes to save (3:8, 9). Golden lampstand and olive trees (4:2, 3) The Lord empowers Israel by His Spirit (4:6). Flying scroll (5:1) Dishonesty is cursed (5:3). Woman in the basket (5:6, 7) Wickedness will be removed (5:9). Four chariots (6:1) The spirits of heaven execute judgement on the whole earth (6:5, 7). New Geneva study Bible. 1997, c1995 (electronic ed.) (Zac 1.2). Nashville: Thomas Nelson. Served as a prophet to Judah about 520 B.C., after the return from exile. The exiles had returned from captivity to rebuild their Temple. But work on the Temple had stalled, and the people were ignoring their service to God. 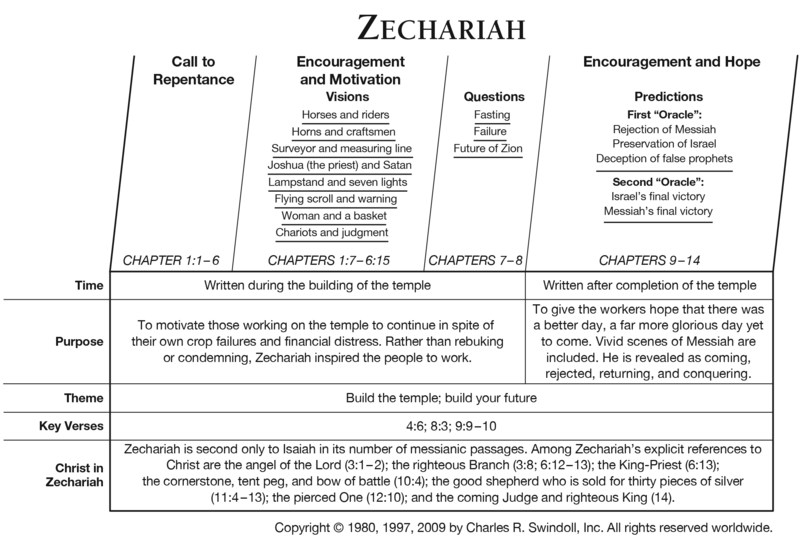 Zechariah, like Haggai, encouraged the people to finish rebuilding the Temple. His visions gave the people hope. He told the people of a future king who would one day establish an eternal Kingdom. Even in times of discouragement and despair, God is working out his plan. God protects and guides us. Zechariah encouraged the people to put away the sin in their lives and to continue rebuilding the temple. His visions described the judgment of Israel's enemies, the blessings to Jerusalem, and the need for God's people to remain pure - avoiding hypocrisy, superficiality, and sin Zechariah's visions provided hope to the people. We also need to carefully follow the instruction to remain pure until Christ returns. Besides encouragement and hope, Zechariah's messages were also a warning that God's messianic Kingdom would not begin as soon as the Temple was complete. Israel's enemies would be judged and the King would come, but God's people would themselves face many difficult circumstances before experiencing the blessing of the messianic Kingdom. We too, may face much sorrow, disappointment, and distress before coming into Christ's eternal Kingdom.